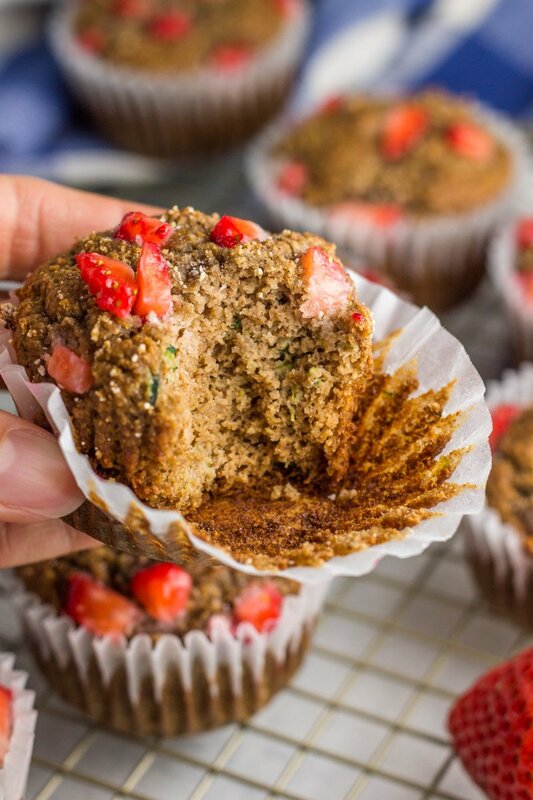 So much goodness in every bite – these almond butter strawberry zucchini muffins are a grain free, dairy free, paleo treat sweetened naturally. If you haven’t tried the combination of almond butter and strawberries, you are missing out! It might be my newest obsession with baked goods. There are situations in life when I can be really stubborn. Not necessarily in relationships (my husband may disagree), but when it comes to planning and execution. Moving? I already have the house decorated in my head and furniture placement set. Having a baby? Ok I sort of winged that but anyway…. I HATED group projects in college, and probably was the worst person to work with. Like just give me everything and let me do it RIGHT. Even if your right is better than my right, I still want to do it right in the right way for me. Does that make sense? Good. 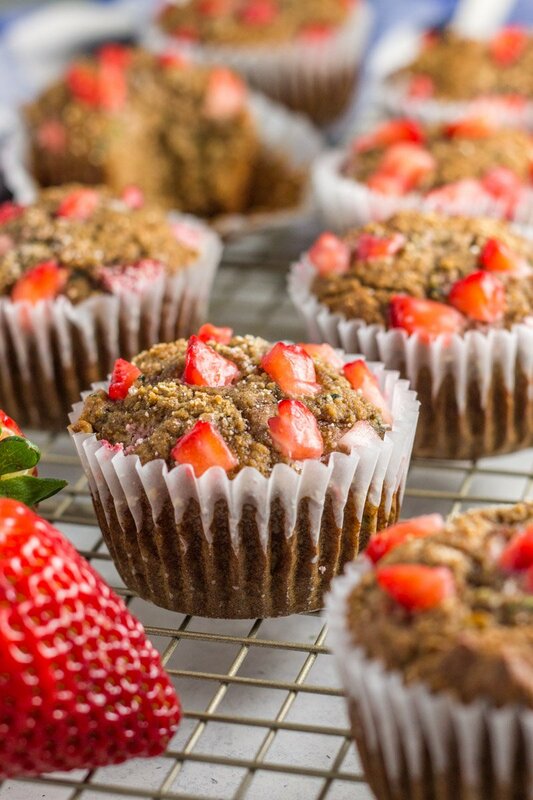 This especially holds true when it comes to these almond butter strawberry zucchini muffins. Look, paleo baking is not where my talents lie, I’m more a ‘meal creator’ kind of girl. But that doesn’t mean my stubborn personality wants to give this category up! Because let’s be honest, who doesn’t love a perfect delicious, totally healthy baked treat? And if we all love eating them, I need to love creating them. Even if it takes 3+ recipe tests. The first bite of a batch undercooked almond butter strawberry zucchini muffins was DELICIOUS, but mushy and flat. I knew I had to try again (the bite was too good not to). I was closer after my second attempt, but still not THERE. Third time’s a charm right?! YES. Finally. That stubborn recipe chick welled deep in my soul was content. I wasn’t willing to try a new combo, I wasn’t willing to sub any ingredients. I just needed these to work and they did. Good thing, because my kiddos love them too. The combination of almond butter and strawberries is one I discovered during my last Whole30 – SO GOOD. Might even top chocolate covered strawberries, for realz. So why not morph that flavor profile in a fluffy, naturally sweetened, paleo muffin? With a little shredded zucchini folded in for moisture and a ‘lil veggie punch?! 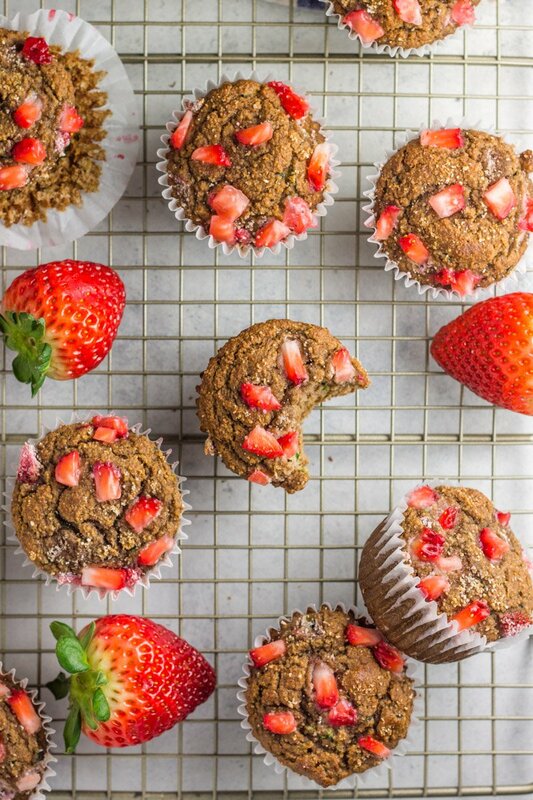 When in need for a quick and healthy breakfast treat on the go, or an afternoon treat, or heck, a post-dinner dessert, these almond butter strawberry zucchini muffins are it. Love using that muffin tin to make goodies? Then try these other fine muffin-tin creations: Flourless ‘Red Velvet’ Beet Mini Muffins, Paleo Butternut Squash Muffins, or these Paleo Pizza Egg Cups! 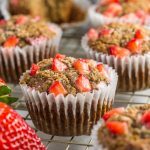 A paleo, gluten free, naturally sweetened muffin recipe packed with an almond butter base, with strawberries and zucchini. Healthy and delicious. Looks delicious. As a diabetic can you tell me how many carbs are in one muffin? I think it would make a nice breakfast on the go. I’m sorry, unfortunately I don’t have that information! Awesome! My girls will love these for a grab and go breakfast!! Hi! I have a question! In terms of almond flour— does it matter blanched or unblanched? Will either work? Making these tomorrow and I can’t wait! These sound amazing!! How would you adjust the time for mini muffins? Hi- can the coconut flour be replaced with another 1/2 cup of almond flour? Delicious!!! So glad you kept at it to perfect the recipe! I love feeding my kids healthy snacks. These are amazingly delicious!!! Thank you! The whole family loves them! Oh and of course I had to taste the batter first and holy cow delish!!! Isn’t the batter addicting?!?!? So glad you enjoyed these muffins! Do I dare double the recipe… or is it worth just making 2 batches? I’m nervous haha! But sooooo excited!!!!! Just finished making these, and they are so delicious! Thanks for working so hard on this recipe! My toddler is inhaling one as I write this 🙂 I’ve made so many of your recipes recently and they’ve all been home runs. Thanks for all you do!! Oh Allison, I’m so happy to hear that! Thank you! I made these last week and I was kind of skeptical they would be any good.. But holy hanna they were everything a muffin should be. They had great texture. They were tender and moist.Best of all they tasted great. WHOO HOO! Glad these proved you wrong. Thanks Julie! Just made these muffins and they are tasty! I made 12 mini muffins (baked for only 12 minutes) and used the rest of the batter for regular muffins. Thanks for the feedback on the mini muffins Katie! Yessss so happy to hear that! Could I sub peanut butter for the almond butter? I live in Europe and almond butter costs a fortune! Cannot wait to make these for my toddler tomorrow!!! Hope the little one loved them! So thrilled to hear that. Thanks Natalie! How do you store your muffins. In frigid or in Tupperware? I usually store them in the refrigerator in a tupperware. Keeps longer that way!